All title and book cover images take you to Booktopia for easy purchase or to a more in-depth review. PudStar and ChickPea (AKA The Wild Thing) love their cubbyhouse. 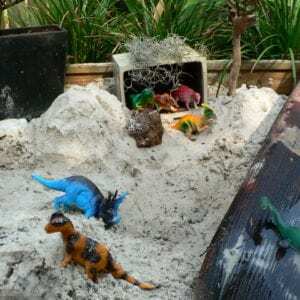 Mostly it’s a mess – as it should be given it’s in a Qld backyard (think spiders, mozzies, geckos…thankfully no snakes yet!). There is also much time spent making sand and flower pies and shooing chooks out of the cubby…so yeah, it’s a mess mostly. But every few months, Pud pulls everything out and cleans it. Some time ago she turned it into her art studio, thanks to visits to Narelle Oliver and Stephen Axelsen and their lovely studios. You can read about that here and here. 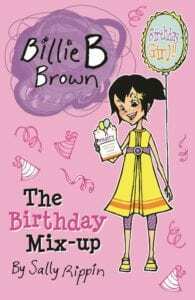 I recently scored some Billlie B Brown bunting – benefits of being a librarian. 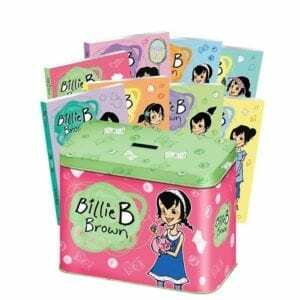 So now the art studio/cubbyhouse is also a Billie B Brown Clubhouse and the microscope has been moved in, all the Billie B Brown books, the Billie B Brown tins, and pencils and paper and clipboards for club business. I don’t know what club business is as I’m not allowed in, but ChickPea came inside howling that she wasn’t allowed in the club anymore, so it seems it’s just now Pud in the Billie B Club. Siblings. 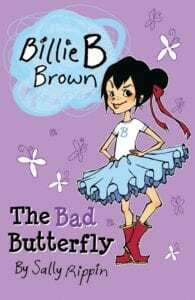 Pud, at six, is becoming a more independent reader and I have silently praised author Sally Rippin on many an occasion. 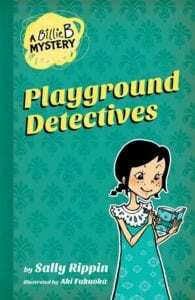 This series of books has been instrumental in developing Puds confidence in reading, but more importantly, developing her love of of a good story. 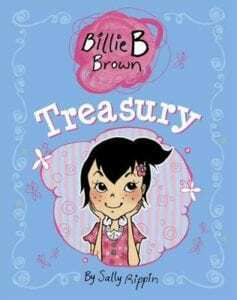 The Billie B Brown stories are fast paced, engaging and perfectly pitched at their young audience. 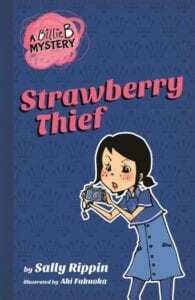 For more chapter books for beginning readers see here. 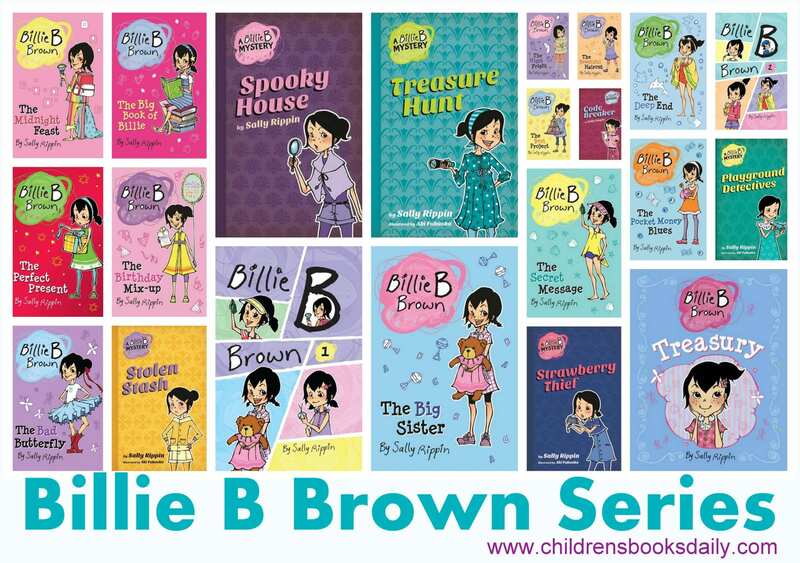 Just when Pud has read each book twenty times or so…the ‘Billie B Brown: Mysteries series’ was released! Yay! 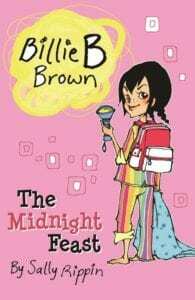 These are a slightly higher reading level and have a more in depth storyline – a perfect step up from the original Billie B Brown series and one step away from some other fabulous chapter book series for young readers like ‘Lulu Bell‘, ‘Clementine Rose‘, ‘Bella Dancerella‘ and ‘Violet Mackerel‘ (then onto ‘The Kingdom of Silk‘ series and ‘Our Australian Girl‘ series when they are a little older again – I have your child’s reading journey mapped out for you!). 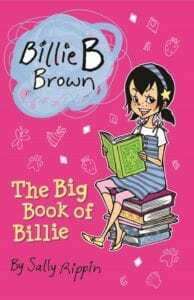 A selection of Billie B Brown titles are below…add some to your home, school or library collection! Ellie and the Viking have a tent they refer to as their outside house. 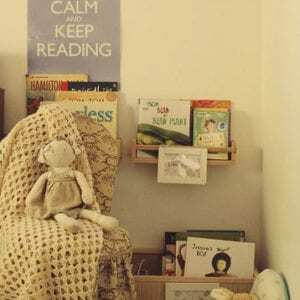 It has all the benefits of a cubby, and we can move it or pack it up. It is a treat that comes out in school holidays or for parties. We had the most delightful cubby as children – a real little house that was christened “Canary Cottage” and built for us by a Great Uncle. We loved that little place! It was flatpacked and moved with us three times – then it went back up the mountains to that Great Uncles great grandchildren. I believe it is still in use!! 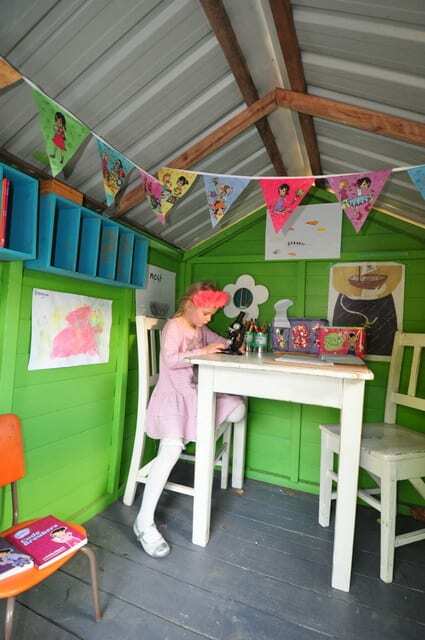 My two turn anything into a cubby these days – and also spend time making “nests” in the playground at school, a bit like Joanne did back in the day! 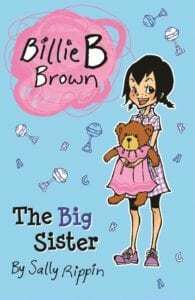 My daughter is a big Billie B fan – and has read quite a few titles. 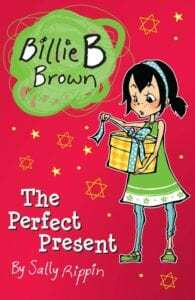 I think she would love the giftset – and would happily gift the books she has already read! My hiding place (cubby house) was the mulberry tree in the very back corner of our yard. It was difficult to escape from my eight other siblings but that was my hideout. 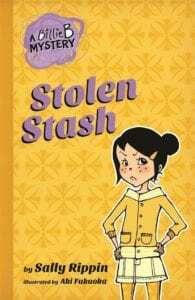 Mum always knew where I had been – the purple mouth was a giveaway or the smell of mint I would absorb when I jumped into the patch below the tree when I had to return to the real world. 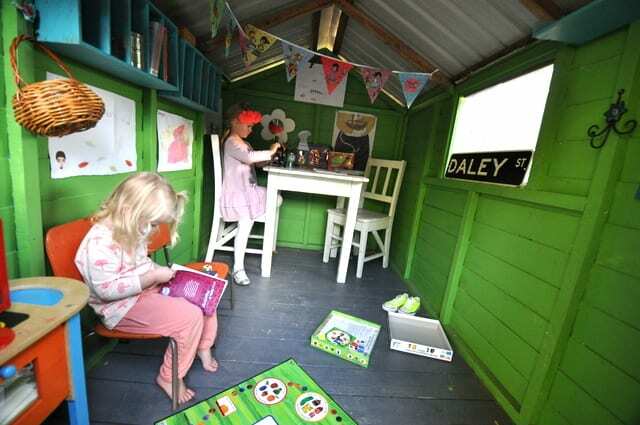 My three children are lucky to have a lovely big cubby complete with it’s own deck. It has inspired lots of imaginative play. In recent times it has been a pub, a library and coffee shop. They are most happiest when mixing up leaves, flowers and dirt to serve their best customers, Grandma and Mum. My three children are lucky enough to have a cubby house complete with it’s own deck. It has been a source of lots of imaginative play. In recent times it has been a pub, a library and a coffee shop. They are at their happiest when missing up leaves, flowers and dirt to serve to their best customers, Grandma and Mum. We had an old climbing frame which we used to drape with blankets – it was a hideout against gun wielding villains, a fort for the troops, a mountain cave where we rested between arduous treks (sometimes all on the same day as we could never agree for long). At other times it became a ship as we adventured on high seas. When I was a little girl my grandma had a lovely pine tree which my cousins, my brothers and I turned into a club house. We each had our own ‘room’. The tree seemed to go on forever and a day but I look it now and it thin and boring. When it was the club house it was an adventure! 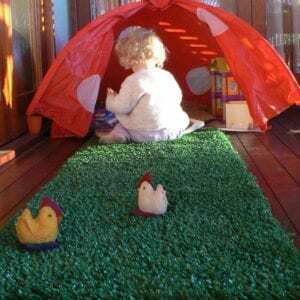 As a grandmother, thinking back on the cubby house my sister and I and friends made and played in takes me back to another era and a simpler time. Under the house, talking and planning while making daisy chains, organising and practising items for our “concert” of poems and songs, which was the highlight of the holidays, and basing our daily play on the adventures The Famous Five, we graciously allowed my mother to visit the cubby house with our homemade morning and afternoon teas and lunches! We lived in our imaginations, we were never bored, and we played happily all day. Happy memories that I hope for my grandchildren as well! I have great memories as a child of playing in the neighbourhood cubby house. All the kids in the street would play there together. It was in the bush land behind our houses. I grew up on property so we made our own cubby house down the back in the bush out of whatever materials we could find in dads shed. It was a great place to hide, read books and my brother use to practice his scout skills. We also painted it blue as that was the paint we found in the shed. My three kids have made their own cubby we used the frame from the kids old trampoline frame. Our childhood cubby house consisted of a giant table cloth draped over 4 chairs! It was well ventilated. When I was 10, we moved to a house that had a little woodshed in the back yard which my sister and I instantly declared our “club house”. It was pretty dark in there but we put posters from music magazines on the walls, and our old little table and chairs set, it was cramped, and a bit smelly, but we spent hours in there. One day we painted the outside of it and felt so proud of ourselves until our dad explained that we had used water colours and they would wash away quite quickly! 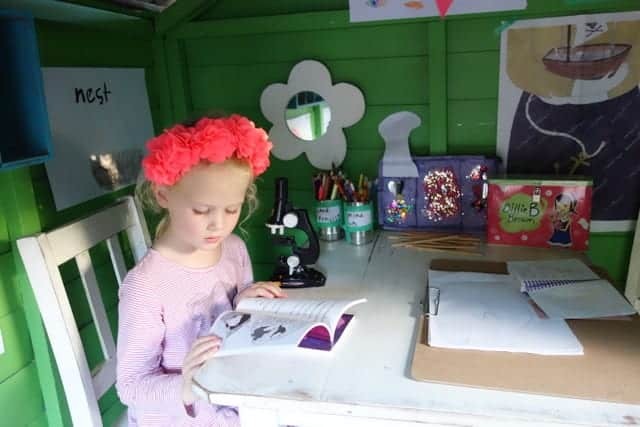 I had a friend who had a cubby with a barn door (where the top of the door can be open but the bottom still closed) and I thought it was the coolest thing I had ever seen) – i never forgot about that, so when hubby offered to make our girls a cubby for Christmas last year, it was the one thing I asked him to do 🙂 I finally have the cubby I always wanted haha.